The Triple Cup Suction Mount allows you to place the Cone Cam or small camcorder on any relatively flat and smooth surface. Unit consists of triple suction cup base with removeable universal mount which allows the camera to swivel and move thru various angles. Mounting options are only limited by your imagination and the contour of your car. Mount it on the roof or on the rear bumper to see those cars fade in the distance. Mount it above the wheel to see how much your tire is flexing under load. Get the 'A-Team' cam effect to see your front wheel turn as the road flies by. This mount will stick to any non-porous surface that is relatively flat. The camera cable doubles up as a tether should the mount come loose. 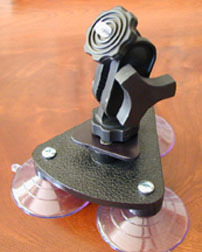 Or an additional tether can be attached to the top of the camera using the alternate tripod mount hole. IMPORTANT NOTE: This mount is intended ONLY for small cameras such as the Cone Cam or a small camcorder. When you're mounting an expensive camcorder to a fast-moving vehicle, you want to be sure that it's going to be secure. We decided to test this mount to see how much weight it could support. Here's a picture of the triple suction cup mount holding 75 lbs. of weight. We seriously doubt that you'll be hanging 75 lbs. of camera on your vehicle, but we just wanted to show you that you can safely mount a small camcorder without any concern of it falling off. Note: Although we don't recommend attaching 75 pounds of weight to your car when you're racing! We recommend always using a tether to protect your camcorder and the safety of yourself and others. The triple suction. cup mount has also been tested to 200mph.